Every evening, from 7pm till 8pm, while I put Jac to bed (most nights anyway), it’s Jamie time with us and he seems to be really enjoying it. We play board games or puzzles and read books, but Claire has also got a Reception level word set, which Jamie is working through. 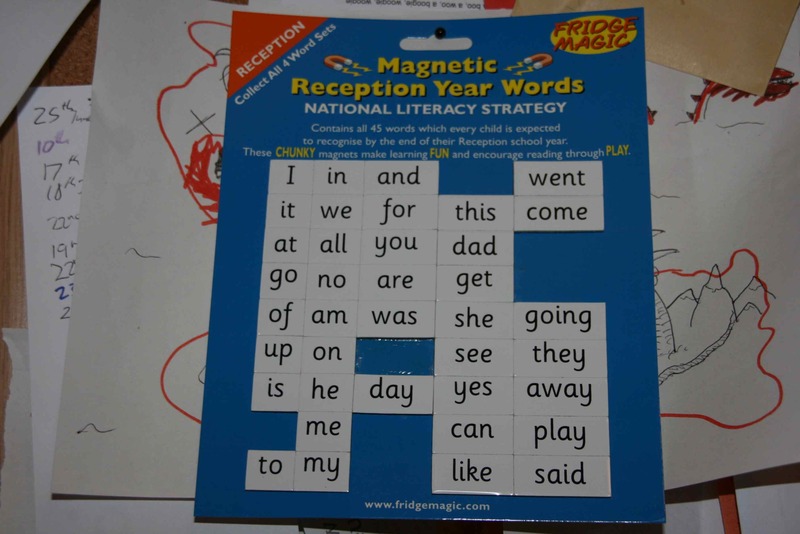 It’s from http://www.fridgemagnet.com and has the 45 words which school children are meant to be able to read by the end of this year in school. Every time we get a new word for him, he reads it, we talk about it, then he puts it on the freezer door. He’s doing really well and i’m also going to start getting him to write them out as well, therefore giving him writing practice and hopefully learning the word better. In the spirit of finding out ‘what the other half’ are doing in Reception class (or probably 99% of children! ), I had a brief look into what the requirements are for children at the first couple of stages of school. It was a bit strange seeing the parents for the Reception class sitting waiting for their kids to come out, while I was with the boys at their active tots group. So, 45 words expected to be read by the end of Reception year. This gives us something to aim at and to try and to follow as a guide, so that if Jamie does decide somewhere down the line that he does want to try school out, he won’t be too far behind. It’s also a good guide for Jac who hasn’t yet been through the ‘will he, won’t he’ process of schooling! So far Jamie can recognise various letters by sound, name and association (eg ‘P’ for police car). Another very useful website is the UK IXL site for the various maths requirements at each stage of school. In terms of Reception level, Jamie is probably already at stage E and the next stage is counting with money. He’s generally been very good with numbers and it’s something the teachers at his old playgroup commented on. Jac’s also been copying his ‘what does that say’ line and does this a lot now. I can see Jac developing faster than Jamie as he’s over 2 years younger and therefore has the benefit of our own learning with Jamie. I might even learn a few things along the way. Adults and children all over Gloucestershire are right now stressing out, looking for socks, books, bags and trying to get ready to go back to school! We’re not though. Today is the first day of Jamie’s official home education! I’m sitting here watching the parents and kids go past our bay window, in their various uniforms, some riding bikes, some walking in little groups, some with parents. It’s an amazing sunny day and full of energy. Jamie would be starting Reception class today, but we’ve decided to not jump into the school system until either he wants to or we feel the advantages would outweigh the disadvantages. We’ve spent the last couple of years considering this and feel it’s the best choice for our family. So far today, I got up with the boys and checked my email. A message from SKP was there with a bouldering video (my latest life pursuit!). Jamie was telling me about climbing and how using both your feet will help to climb higher and that children need special climbing walls. He was saying you can use special stones and wood on the walls to hold onto. I was telling him about the soft crash mats on the floor and he asked about the slight blister I got the last time I went bouldering. He’s very switched on about connections. He’s already made two different Lego models this morning and wants to build more! Jamie has been changing so much over the last 6 months. He’s more self assured and sociable and has been going to play group and sitting and eating food and even joining in with the activities! This is something he basically stopped doing after the very average experience at playgroup at the local school. He wasn’t joining in with the group activities or playing that much with the younger kids. I’ve started to take him and Jac to an active tots group at a different local school every Monday, and both he and Jac seem to really like it. It gives them a chance to mix with other kids and be involved in some more formal activities and settings. Jamie is doing really well at this and today was another good session. I had to take Jac off to use the toilet, while we were all outside with lots of balls in the playground. When I got back, they had got the parachute out and Jamie was standing holding one of the little handles on the side of the parachute and laughing and joining in! It’s great to see. Jamie’s got a lot better at talking to unknown adults and children, for example at the new group, and always likes asking the teacher things and telling her about what he’s been up to. He’s even getting on with Jac better. There’s still the usual scuffles and arguments over sharing toys, but now Jac can join in more and talk to Jamie, things seem to be going better. They can now interact, rather than Jac just appearing like a baby who gets in the way of Jamie’s games. He’s more creative and has been making amazing lego models more and more. He’s been using the influences and experiences around him in his games, in a more obvious way, whereas before he was far more random in his games and imagination & creativity. * Also forgot to say in the original post about Jamie speaking on the phone more and more. Just tonight he was on the phone to Old Nanny and Granddad (his Great Grandparents) and Claire said he was chattering away about various things. He also talked to me at work today about setting up his market stall – cute. 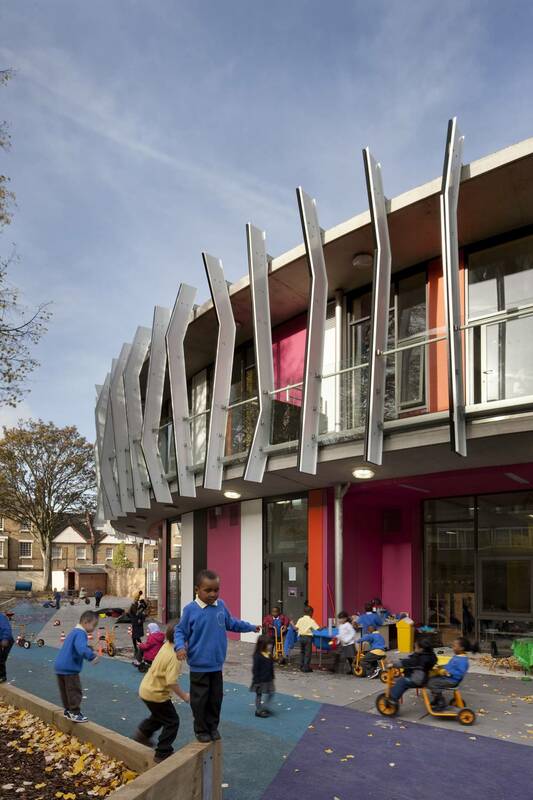 Some amazing images of a recently opened school in Southwark, London. 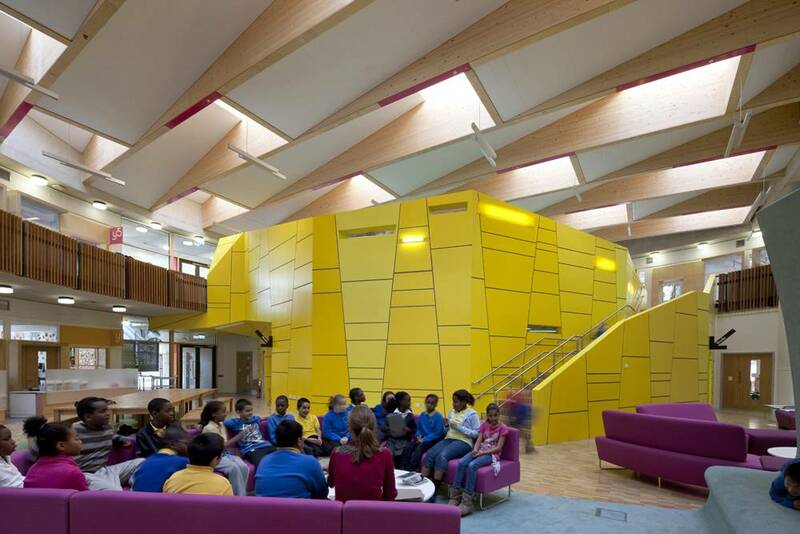 In the AJ article, Will Alsop explains that one of the key things which stuck in his mind from the parents and children, was the need to design a place which was really exciting and unusual, so the kids would want to go there. 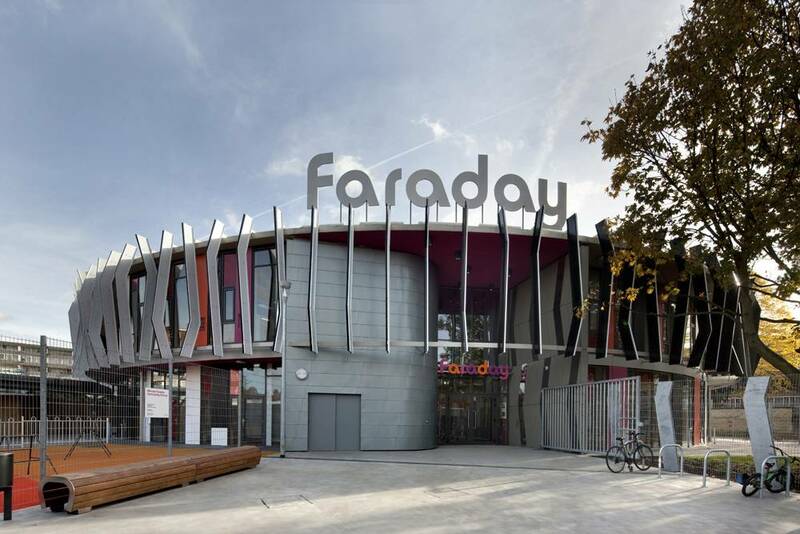 This school is located in an urban setting whose demographic rating (ACORN) puts it among the lowest categories in terms of deprivation and ‘inner city adversity’. 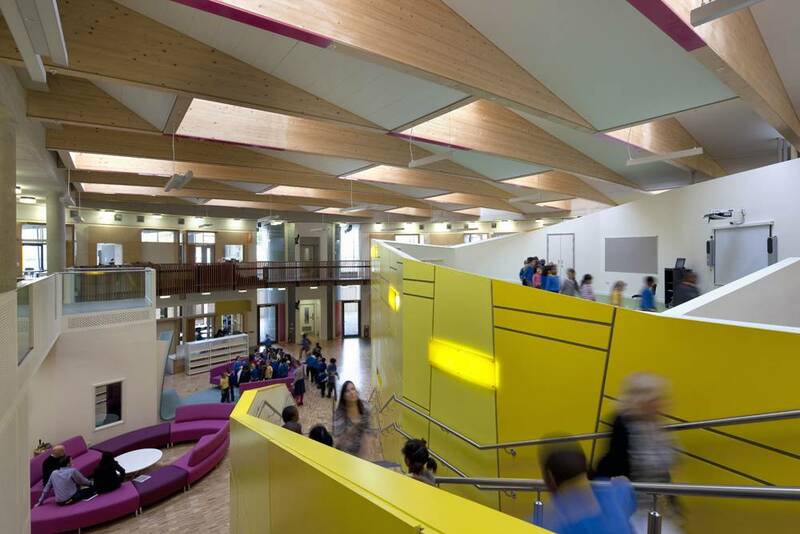 I love the contrast in forms and colours between the roof and yellow stair feature, around a central courtyard. Amazing use of light and colour. There are many ways of describing what we’re taking steps towards doing, but it basically means that Jamie won’t be going to school till he’s at least 7. This doesn’t for 1 second mean both our boys aren’t getting an ‘education’ at home, or not learning a massive amount each day. It’s just a different way of doing it. So, what i’m going to try and do is write a series of posts about the subject, as I read whatever book I happen to be reading on the subject. Right now i’m reading, ‘You are Your Child’s First Teacher’, by Rahima Baldwin Dancy. I’m reading the chapter 12 on cognitive development and early childhood education, as all the previous chapters refer to earlier developmental stages. I’ll probably go back to them at some point, but this seems like a good place to start. I might do bullet points, or full sentences but the main points will come across clearly either way. – Physical development and academic environments: One approach is to not teach formally until the adult teeth have been fully grown (age 6-7). So, general play activities until the body is more developed and the energy needed for its intense early growth is freed for forming mental pictures and memory work. – Academic stress as an obstacle to early physical and mental development: pushing academic pressures onto a 3, 4, 5 or 6 year old can have far-reaching negative impacts. This can be in the form of reading difficulties, with an example given of studies between 5 and 7 year olds. The 5 year olds were more likely to develop reading problems and didn’t achieve better progress, while the older children learnt faster and more willingly. This is a key point. If you are able of your own free will to attempt a task, or to learn something, you will achieve this far more effectively. Our approach is to promote a love of learning, not about anything specific, but as a general principle. The rest is up to them (and us to a certain degree). This is sustainable over your whole life. You have to want to do something for it to really sink in and to be able to sustain an interest in it. – Children in more academic environments tend to be less creative and more anxious: The last thing I want to do is remove my boys obvious creativity. By that I don’t mean I want them to grow up to be artists, I just don’t want to limit what they can achieve or who they can become. Creativity can mean anything from being an artist to simply working out different ways to do something – vital for day to day life. Aside from the job and house work stuff which seems to occupy a fair bit of our mental energy, there are a couple of things, to do with Jamie, which are really causing some stress. The first is his teeth, the second is the whole playgroup/school thing. So, dentist was meant to be on Monday (depending on a couple of other things, but has now not happened), to look at his front teeth and a possible new hole. We’re cleaning teeth last thing at night and after breakfast now but I just hope his front teeth remain ok. There’s a long story attached to this, but there’s only room in this post for a single massive story! Part of the problem is just settling back down with new younger children in class, as he was doing the PM slot on Tuesday, rather than the AM slot. Also, some of them really want to play with Jamie but sometimes he just wants to play by himself. He can get a bit frustrated at these times. This is also to do with feeling the same emotions as he feels with Jac, like not wanting to share toys etc. They also shift around the activities during the playgroup and if he’s into doing something, he doesn’t want to change things. I don’t actually think for 1 minute that there is an issue of bullying here. We have been in contact with his teacher (1 of 4 there) who has been checking on him. She has explained a number of the incidents and they all seem to be fairly innocuous. For example, when he was ‘blocked’ by a boy with his bike, this was actually when a boy went the wrong way around the play shed, then bumped into Jamie. Our lack of interaction or contact with the teachers also feels quite weird to me, but they all seem to know what they’re doing. Also, Jamie has said a couple of times that a boy has been mean to him, but when a friend came over the other day to play with him, Jamie also said he was mean to him. What actually happened was that this boy kept wanting to play with Jamie, but Jamie just didn’t feel like playing with him + there is sometimes a toy issue, in that he doesn’t want to share things. Hardly the end of the world. I can explain away all the incidents but at the end of the day, it is making him unhappy and he doesn’t want to be there. I was in Bristol the other day on a training course and was talking to Claire on the phone about Jamie and the playgroup thing. It was last Thursday and he really didn’t want to go to the group. In the end, Claire didn’t make him and said he didn’t have to go, but as soon as she said that, she said it was like he was a different person – very happy and chatty the rest of the day and she said it seemed like a weight had been lifted from his shoulders. I mentioned some of the things to my colleague who was on the course with me and he thought the fact that he was really happy that he didn’t have to go was the most shocking thing about it. I have to say I agree. The whole school issue is also coming up. 30 kids to a class, with 1 support teacher? The various research that has been done on child development, particularly in boys, which basically concludes that boys only start to tune in to academic learning from age 7. The physical side to their development is much more significant and this can be seen in boys of any age, not just the very young ones. I don’t want to stereotype unnecessarily but there are fairly strong patterns to the different ages and genders. For these two reasons, at least from my point of view, we have decided to only send him to playgroup if he wants to go and also to not send him to school until age 7. We’ve been intensely thinking about this for over a year and it’s got to the point where I feel we are over-thinking about it, to a significant degree. This relates to my deeply held belief that over-analysis and over-thinking can lead to inaction and indecisiveness. There is obviously an essential thinking / consideration element to life which is fundamental to a progressive society, but you also have to just make a decision and get on with your life. DO: research, consider, think, research, consider, act. I can’t highlight enough the importance of researching a problem, then considering that research, but there is a point when you have done that, but because it’s a hard decision (which might take some effort or money or stress or time) you put it off. Putting off that sort of important decision is not good. We’ve fallen into the trap. Anything to do with kids is significant. This is why we’ve been considering things for so long. The whole raising kids thing is so full of pressure and work that everything seems to be so important. Every day there are new challenges and it stretches you in ways you’ve never imagined. It tests your mental and physical resolve. It makes you a stronger and more capable person, but it is also draining. But… everyday you just have to get on with it. You just become ‘a parent’. There’s a point where you stop freaking out about things and just read them a book, change a nappy, go to the park… whatever. I used to freak out about the rough age when kids would be able to remember the things which you said (maybe age 3). Now, I look at it as a good thing – now I can teach them things which I wish I had been taught. *slight off-subject alert* – I signed up to ‘Reading Buddies’ with a kid at our local school (also called Matt) for 2 years. One day, we were choosing a book to read and he was trying to worm his way out of doing anything which could be called reading. I noticed a book about Volcanoes. I said to him that i’d actually stood at the top of that volcano on that page – referring to Mauna Kea on Hawaii. I said that you stand so high that you are way above the clouds and it’s hard to breath. I also said it’s the 3rd tallest volcano in the entire solar system, Olypus Mons on Mars being the highest. I talked about the massive observatory domes up there and the strange black landscapes. He looked at me in total awe. I’m not joking. I’ll always remember that moment. The scale and insight of the information must have really affected him. Well, it’s easy to get caught up in all this stuff. But we are now fully functional parents and it doesn’t all seem so new or strange. So, what if he doesn’t go to school, to sit in class of 30 other kids, all competing for attention and space? My normal logical self seems to be finally kicking in. We’ve been very ‘not bothered either way for a while’ but it’s starting to clear a bit. The crux of the matter is the 30 per class thing and my experience during Reading Buddies. We’re going to see what happens but just wanted to get some things on here, partly for posterity but partly to lay it out to see if it made any sense! So, busy week at home coming up… Surveyor in on Monday to do a full check, relating to the 2050 grant scheme for eco home improvements, same day dentist for Jamie, on Tuesday it’s playgroup D-Day. Wish us luck! Ok, i’ve got 10 mins (ok, maybe 30) while Claire’s on Jac duty to post about what we see as the positives and negatives of home education and ‘normal’ school. This is not an exhaustive list but it sums up certainly how I see it. We put this list together some time ago when we first started considering the ideas and there are probably loads more details I could add. I have to also say that there are counter-arguments to pretty much every point on the list (Mrs KP i’m watching you!!) but it still helps to write it down and go through everything. I feel neither system is ideal and both have particular failings. Also, JJ refers to both our kids and HE = home education. – JJ may feel more ‘normal’ at school and there is a chance they could feel isolated or left out at home. From my own experiences of school, not being normal in some ways can be hard. – There wouldn’t be any awkward questions about the whole issue from work colleagues or family. This is a continuation of the normal issue which extends way into adult life, particularly with some adults entrenched views on certain issues! – More personal time / energy / organisation is required in some ways to HE and with school, you just drop the kids off and walk away for a good part of the day. – We would not be able to both go back to work and would be reliant on a single salary, if one of us is at home with the kids. This would mean less income. – There would be more limited contact with children within their own age group if at home and less chance to meet local kids and therefore local families. – We have no teaching experience and may not know the best ways to teach JJ. – School offers at least a basic exposure to a wide range of subjects, some of which I might not be that keen to cover at home. I remember finding Shakespeare and Physics a pain in the arse at school, but now really appreciate covering those things. – There would be a more limited ‘systems’ exposure at home. Like it or not, we live within some fairly strict cultural structures and the work environment can be one of these – knowing how to operate in them is essential. – There are no name tags or uniforms at home. – Less illness. So far, my experience, as well as those of other people on this issue goes something like; the more contact a child has with other children, the more illnesses they will pickup, due to their undeveloped immune systems and the numbers of potential carriers. Nurseries are a classic example, where loads of kids are shoved together and illness spreads around like wildfire. The parents then get ill more often etc etc. – The school system does not allow a focus on a particular subject as there are so many subjects which are required. The same amount of time is given to each subject (in general) and you can’t tailor learning to the individual’s strengths or needs. – At home, there is a 1 to 1 (or in our case, a 2 to 1) teaching environment, where JJs questions on anything can be answered straight away (or quickly with a Google search). The quality of the answer and the length of the answer will also be better than at school, given the focus of attention and not having to man-manage the other 29 pupils in the class!! – JJ will be able to ask more questions than at school and the answers will be more complete and not just ‘directional’ i.e. John sit down, Will stop talking to Ben, Sam turn your phone off, Liz where is your reading book etc etc etc! I have been experiencing this ‘teaching’ environment as part of my Reading Buddies 2-year stint. – Holidays outside of term time (if you have school kids, I won’t have to say much more about this!). This is more flexible, much cheaper and overall much less restrictive. – JJ will have a much greater chance of establishing friendships with people outside of his age group as he will come into contact with more of them. This will help greatly in later life and while growing up, with the greater knowledge older people have etc. – Peer-related pressures are less relevant at home, such as having the expensive trainers or latest computer games. DIY and practical skills where they help with the house, not just ignore it while Dad gets on with it! – Flexible exam timetable. JJ can sit GCSE or A-Level exams at any point and do not have to be at school to do this. – There are no SATs at home – a subject which i’ve witnessed really get parents going about. This idea of continual testing is absurd and highly counter-productive and sets up a life-long fear/annoyance/dread of testing in general. The fear of failure and not being normal, the endless time spent revising a particular set of information which a committee has decided should be on a particular syllabus etc etc. It’s also the distinct lack of exams while in the work environment – is this school life of exams a good grounding? – More real-life experiences while at home. Stuck in a classroom is not the best place for this. – Growing up with a stronger influence from parents and their values, including a better diet! I’ve been wanting to work out a few education issues for a while but the house and exhibition have been taking up most of my time. Jamie has his first half day at Play Group tomorrow, and this is bringing up a few decisions which we need to be thinking about more. I want to get around to looking at the home education issues, such as the Badman Review and the positives and negatives of the system, to get it clear in my own mind. We can then be more confident about what it is we’re doing and why. Anyway, first half day in the afternoon tomorrow then a morning session on Thursday – nervous time for the parents but I think jamie is looking forward to it! We’ll see how he gets on this week and once the exhibition is up I can look at the issues a bit more.